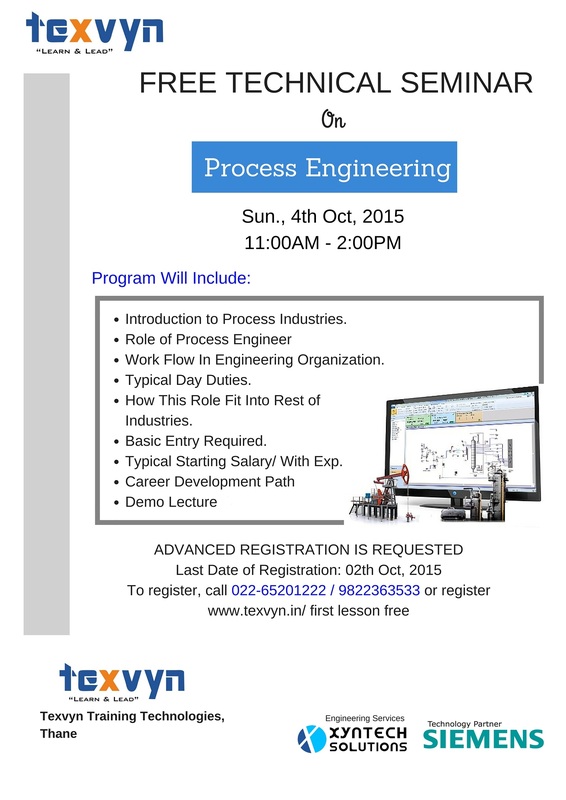 Texvyn Technology will be hosting a Free Technical Seminar at Thane on Sunday, 4th Oct., 2015 [Time: 11.00AM -2.00PM]. The seminar is entitled: “Process Engineering as a Career”. Due to a limited number of seats, please register by contacting Mr. Nikhil V at: info@texvyn.in (phone: 022-65201222) or registering yourself by visiting us at http://www.texvyn.in/#!book-your-first-free-lessons/c2049 [Mention Topic Name as “Process Engineering as a Career”]. Texvyn offers High End Professional Industrial Knowledge & Exposure to cutting edge Technologies. Texvyn is Group Company for Xyntech Solutions Pvt. Ltd. with an exclusive channel partnership with SIEMENS AG [Germany]. Last Date of Registration: 02th Oct., 2015.